Mariah Carey posted a cryptic tweet on Sunday (26Feb17), insisting she will always have ex-husband Nick Cannon's back. The Butterfly singer took to her Twitter to share a message in which she revealed her support for her ex-husband, and the father of their five-year-old twins Moroccan and Monroe, is never-ending. "There's no validity to the false allegations looming in the press regarding our family," the text image read. "Nick is the father of my children, we will always stand up for each other, have each other's backs and we will always remain a strong family." 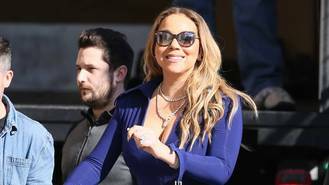 While Mariah didn't make it clear exactly what she was referring to, it has since been speculated she may have been talking about an article U.S. tabloid the National Enquirer was planning to run last week (ends24Feb), in which they suggested Nick had suffered a breakdown, causing Mariah to plan to fight for full custody of their twins. Nick previously slammed the publication, sharing a picture of what appeared to be an Enquirer editor's pitch for a comment from the presenter, alongside the caption: "MORE LIES!!! So the @enquirer wants to play around with my children. Only Evil operates in this manner. What is the purpose? Except to exemplify pure immoral wickedness. "If you report these lies expect a slander and defamation lawsuit. Look everyone, see how the media is trying to break a King? It's all good though, I'm a warrior! I was built for this! Me and my family, my mindset, and my spirit are all stronger than ever. "I felt like releasing this so called 'journalist' info to the public so you all can get at them, but instead I release nothing but positive energy into the Universe. No weapon formed against me shall prosper! I receive help through prayer and patience!" Mariah and Nick married in 2008, and welcomed the twins in April, 2011. Nick announced he and Mariah's split in 2014, and filed for divorce in December that year (14). Their divorce was finalised last year (16). Drake reunited with The Weeknd onstage on Saturday for a surprise collaboration during the rapper's concert in Germany. Rapper Nicki Minaj has parted ways with U.S. retailer Kmart after company bosses decided to discontinue her clothing line. Lionel Richie has officially put his joint tour with Mariah Carey on hold until he is able to dance All Night Long once more. Lily Allen's new music is about motherhood. Demi Lovato apologised on Friday (24Feb17) for sharing the results of a DNA test which revealed she is one per cent African. Chris Martin has denied his band Coldplay are planning peace concerts in Israel and Palestine. American rock band Foo Fighters have been confirmed to headline Glastonbury Festival 2017. Robin Thicke and Paula Patton's restraining order trial will be closed to the public. The Lumineers' new single 'Angela' was recorded without them knowing.